the other day i was riding in the car with my husband & kids. i looked over at my husband who was driving and said "slow down,i want to look at the trash". he couldn't stop laughing and he thinks i'm so weird. he told me i could get out and walk if i liked and that he'd even give me his belt so i could bind up my findings and sling them over my shoulder when walking home. i figure "what does he know?" he still says when describing my occupation- "she makes stuff". i get a kick out of that story because i know no matter how hard i try i can't convince him that one man's trash is this woman's treasure. my kids even get embarrassed when i go around the block a few times to scope out an object before plucking it from the garbage. i'll have you know that is how i found a really nice wooden coat tree! i have come to the realization some people just aren't cut out for seeing it the way we do,some people see it " a little" some people see it "almost all the way" and then there are the few who see it "the same". these are the ones who say "wow look at that" at the exact same time as you do when entering an antique shop (or driving by a pile of garbage). we have to be patient with the primitive-impaired- they are still in training and we should not loose hope for them. it's an uphill battle, i have family and friends who look at my dolls and still say "um that's nice" - gee thanks...i'd probably get a better response from the trash man...at least he'd say "it's ready for the trash lady" and i'd have to smile at him and say "that's more like it!". i studied outsider art as an undergrad, after some fighting with my tutor as he was not prepared to recognize it as anything but 'whimsical' to begin with. then when i got into the project we both discovered the depth and complexity to this area of art.....now i do not like giving absolute definitions but would say outsider art differs from other forms by the fact the work created is not classed as art by the creator, rather it is a necessary pursuit, their only true way of expression. the artist/creator is an outsider due to mental ill-health, eccentricity or behavior society deems less than the norm. the 'art' is not called this by its maker but is often hidden away. the materials used are often very basic and cheap. the term outsider art has been taken and mis-used over the years. outsider may have been hip over recent decades but the true outsider artist would shy away from any publicity and would not wish to be parted from their work, if they are alive. there is a worthy magazine called raw visions which is worth checking out. this mag covers outsider and naive folk art. if you have some fabric in your stash that is outdated or not your style and you don't want to shred it up for filling dolls consider wrapping gifts with it. 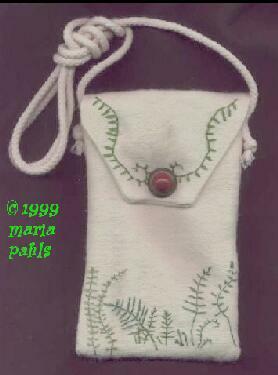 the ferns on the little bag were done with embroidery floss. stitched in a variety of greens, the delicate ferns are rendered using only a "straight stitch" or a "back stitch". the finished bag is fully lined with no sloppy embroidery threads to snag. enlarge/elongate the pattern and trace onto a 33" piece of heavy ticking or muslin-the pattern piece should be 32". one of two techniques can be used to embroider the bag. fold the bag in half r.s.t. matching the beveled "A" ends. pin in place and sew with a �" allowance leaving open a 3"-4 1/2" (big enough to squeeze your hand in) section of one side for turning. trim seams to 1/8" except in 3" area. once the bag is turned and pressed use the 3" opening to enter the embroidery floss and render the design. pass through one layer of fabric only to keep the bag lining neat. knot all floss in between the two layers of fabric. alternately you can fold the cut fabric in half using the diagrams as a guide matching "A" ends. next fold up the flat end and fold down the tapered ends to resemble bag shape. mark with chalk the areas that will be embroidered noting which side is "up". unfold bag and render fern design. then sew as directed facing, embroidery to center during sewing. about the embroidery: use a 3-ply piece of floss for the embroidery. note the ferns on the lip of the bag are embroidered in the opposite direction of the ferns on the body of the bag. sew small opening shut when embroidery is complete. with the right side of the embroidery facing in, fold and sew the body of the bag by hand catching the inner two layers of fabric with the thread. knot off and hide knot. turn purse and attach a decorative button if desired on the top of the lip. to secure lip to bag use a small snap or hook and eye. use about 18-25" of cording and knot each end. sew ends to sides of bag near lip. use to send as gifts through the mail as they are nice and flat or fill with seed packets and give as gifts. great for toting keys and cash or a small sewing kit. WHAT'S IT? ironware~ since the time of the first ironworks (around 1650)blacksmiths began producing a variety of utilitarian objects. since homes during early times were heated by fireplace a great number of surviving iron work is for the hearth. in addition "hardware" pieces still survive. originally meant to strengthen heavy wood pieces such as cupboards, chests and cabinets, iron braces evolved into decorative accents. trammel~ iron ware piece consisting of an arrangement of links and a hook for raising and lowering a kettle in a fireplace. pewter~ produced from about the mid 1600's to 1850-for countless everyday articles-with the exception of cooking utensils-pewter is a soft metal that can be easily bent, scratched or dented and is ruined when it makes close contact with heat. it is an amalgam of base metals, mostly tin and copper plus varying amounts of other metals. it's color is determined by the composition and can range from a silver-like appearance to a bluish-gray. use caution if you intend to use collected pewter pieces as earlier pieces often contained lead. tin~ a metallic element used to coat other metals to prevent corrosion. MP: have you always been creative? sloth (like rust) consumes faster than labor wars: the used key is always bright. "A man who trims himself to suit everybody will soon whittle himself away." "You have a dollar; I have a dollar. We swap. Now you have my dollar, I have your dollar. We are no better off. You have an idea. I have an idea. We swap. Now you have two ideas, and I have two ideas; both are richer. What you gave you have. What I got, you did not lose." "The reason so few reach the top is because no successful method has yet been devised by which a person may sit down and slide uphill."